There's a mystery afoot in Buffalo, New York! The Skyway has been shut down and the local government refuses to say why! Strange vehicles have been spotted around the city! Camera crews are everywhere! Okay, you can stop clutching your pearls. It's just an episode of Top Gear USA that's being filmed in Buffalo this week, and they shut down the Skyway to traffic in order to do it, reports TV station WGRZ. Though the local Buffalo Niagara Film Commission declined to comment, the show's executive producer confirmed they're shooting in the area because it gives them access to Niagara Falls and Lake Ontario. 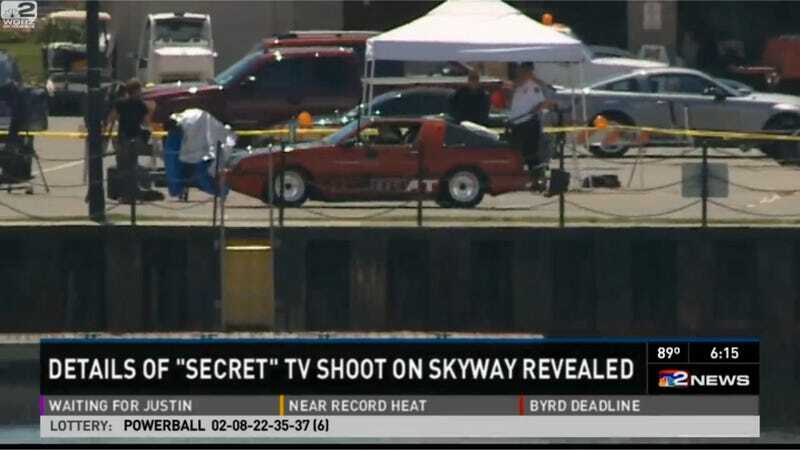 While he wouldn't go into detail about what the episode was about, a few odd-looking cars can be seen in WGRZ's footage of the shoot, most notably what appears to be an amphibious Mitsubishi Starion. Of course, that's just a guess at this point. But it could be that Adam Ferrara, Tanner Foust and Rutledge Wood face a challenge in which they have to custom-build modern day Amphicars, and that's why they need access to the river. We won't know until the episode airs this fall. I'm already interested in what they're cooking up. In fact, guys, I'd be willing to buy an Amphibious StarQuest from you. Matt already bought a Merkur from you jokers; do you have any takers on this one yet? If not, let's talk deal.